Rock Star Mickey is warming up his six strings to rock this house and now you can jam along with him. Learn his moves in How To Be a Rock Star mode or watch him take over the stage with three songs. Mickey's head bobs, he kicks, and finishes with a rock and roll split. 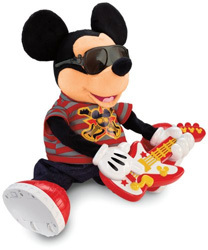 Rock Star Mickey is in his hip jam session attire and cool sunglasses, ready to entertain his fans.